Hair loss is a common problem for men and women. Current treatments for severe hair loss help promote hair regrowth and prevent hair loss, but new research provides hope for growth of new hair in bald areas. Losing hair is physically painless but to many people it could cause a lot of anxiety. Although balding is a common problem, it can affect one’s self confidence, especially when it starts at an early age. Everyone loses a few strands of hair daily. One should not be worried if he/she finds about 100-150 stray hairs on their bed or hairbrush in a day. However, some people are concerned when they find that their thick mop of hair seems to be thinning and their scalp starts showing through their hair in midlife. Male pattern baldnessis the cause of most types of hair loss in men. About two-thirds of men aged 35 start losing some of their hair and more than 85 percent have thin hair by the age of 50. However, a quarter of men who have male pattern baldness start losing their hair before they even reach their 20s. This situation makes men very unhappy and their loss of self-confidence could affect their personal life as well as their careers. Alopecia or hair loss is not just a problem of men. Many women start to have significant hair loss by the age of 40 and this could be very devastating. Although men can sometimes joke about their balding heads, most women suffer silently. Since hair loss is not usually related to a health problem, people, including doctors, do not give a lot of attention to it in terms of finding a medical solution. Hair thinning often happens slowly and one may not notice losing more hair than usual. Hair shedding may occur in clumps in one area (focal hair loss) or from all over the scalp (general hair loss). Men who inherit their male pattern baldness can have bald spots at the top of the head or in the forehead. Women usually thin out their hair starting at the top of their heads. Hair loss that results in male or female pattern baldness is usually an inherited condition. However, there are other possible causes of hair loss. Hair growth slows down with aging, so if we lose hair faster than our bodies can grow back new hairs, then we would naturally have thinner hair as we age. Aside from this, hair strands break more easily with age as hair gets thinner. Chronic physical and emotional stress can result in hair loss. Practices that can cause hair damage and loss include: wearing tight ponytails and braids, pulling hair back tightly, or using hair dyes and curling irons. Other factors that can cause temporary hair lossare malnutrition, iron deficiency, protein deficiency, scalp diseases like ringworm, and several diseases. Read More: How to stop hair loss? Hair loss is not a disease but it may be a symptom of a disease, such as hypothyroidism, where the thyroid gland is under functioning, or hyperthyroidism, where the thyroid gland is over functioning. 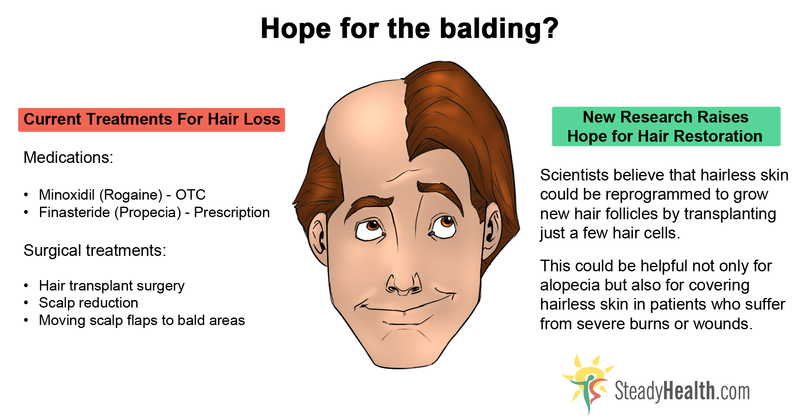 Baldness can also be a side effect of drug therapy, such as chemotherapy, which is used to treat cancer.